First, I hope you all had a marvelous holiday! Mele Kalikimaka! Happy Christmakuh! Etc. The rest of this post is long overdue. Heather and I went to New Orleans in July. It was a marvelous get away, despite being all too quick. But it had a purpose, besides going to one of the most fun cities that we’ve been so far: I wanted to shoot some new pictures for the RAF On The Side Expo. As the incoming president (current president, given it’s December!) of the board of the RAF, I was super excited about our first partnership with the Rochester Contemporary Art Center, and I wanted to have some new work to highlight. It was a show for RAF members to share the artwork they do “on the side”, or those things that aren’t paid work. What does that have to do with tiki drinks? Latitude 29 is one of the coolest places in NOLA, and we went there. Twice. It served as great inspiration, even 5 months later, to create this post (and tomorrow’s, where you can see more). Here are a few pictures from the On The Side show. These are the 4 pieces that were in the show along with 2 others in the series. Reflections of Abe and Spirits of the Bar sold during the show! Here are a few other highlights from our trip. The sign at the Cornstalk hotel. Our room at the Cornstalk. US on the balcony at the Cornstalk. And last but not least, your tiki inspiration! This is my take on the huge variation of Mai Tai recipes that are out there. Mix all ingredients well (except grenadine) and pour over crushed ice in a hurricane glass. Top with a splash of grenadine. Playfully garnish and serve with a straw. Cheers! Have a jazzy new year! I wanted to bring y’all back down South to New Orleans for New Year’s Eve. It seems like a festive way to end the year! 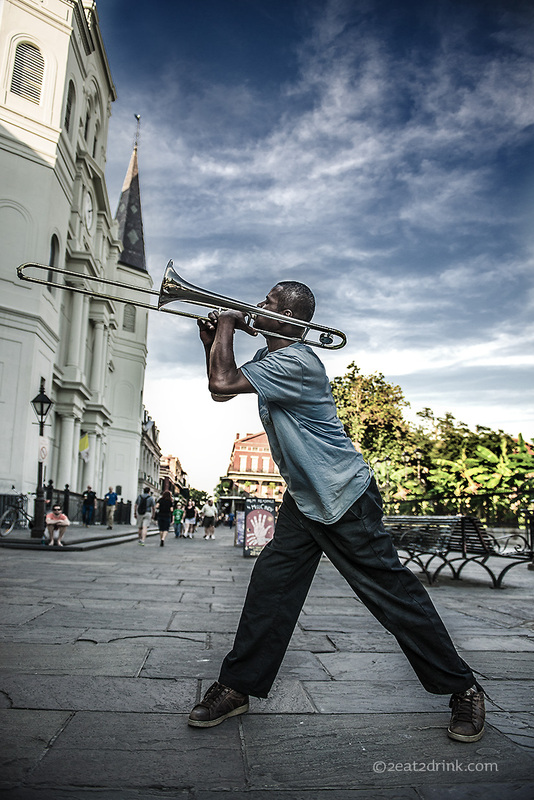 Jackson Square is right in the heart of the French Quarter. A mounted Andrew Jackson rides in the center, surrounded by lush gardens, grand architecture, haunted restaurants, and lively, talented street musicians. As we walked towards the area, we could hear jazz music echoing off the buildings. A small group had gathered to perform for the passing crowds. They were very entertaining! After listening (and photographing) a bit, we wandered through the square on our way to dinner. It was a very relaxing area with people scattered about reading on the grass. Artwork hanging on the fence surrounding Jackson Square. The Louisiana State Museum building. The center of the square. Jackson has been there since 1856. Muriel’s is right on a corner overlooking Jackson Square. It was featured on our ghost tour. They set a place for the resident spirit every night. Blackened Mississippi Catfish. It was awesome! The view down St. Ann. The view down Chartres Street. Have a safe and happy evening and a fabulous new year! Cheers! 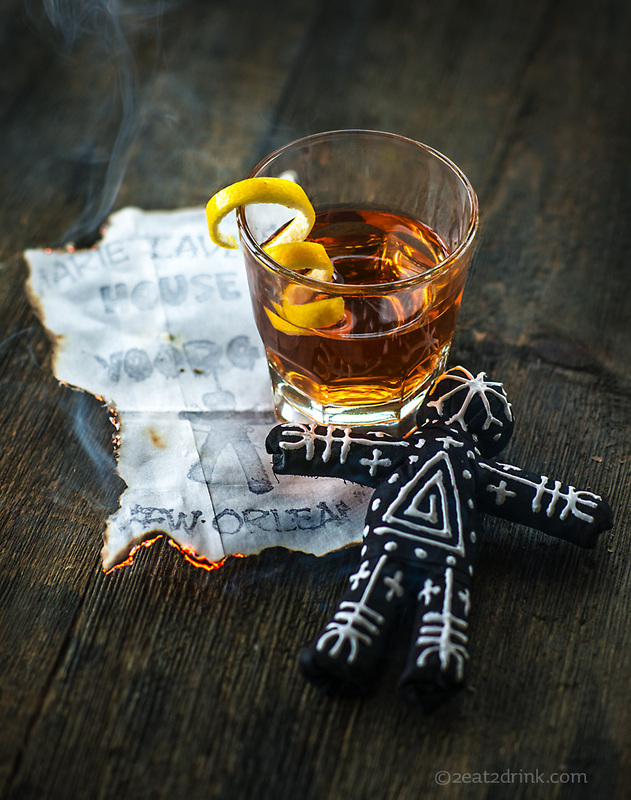 I thought a Halloween post would be the perfect way to introduce the Sazerac, a drink that is as much a part of New Orleans as Halloween celebrations are. Its roots can be traced back to a French Quarter apothecary, Antoine Peychaud, in the early 1800s. But the drink was modified to its current recipe in the early 1900s to feature Rye instead of Cognac. It’s extremely flavorful and highly recommended. Our voodoo doll came from Marie Laveau’s House Of Voodoo on Bourbon Street. It’s a great little shop with many voodoo dolls, talismans, and charms. 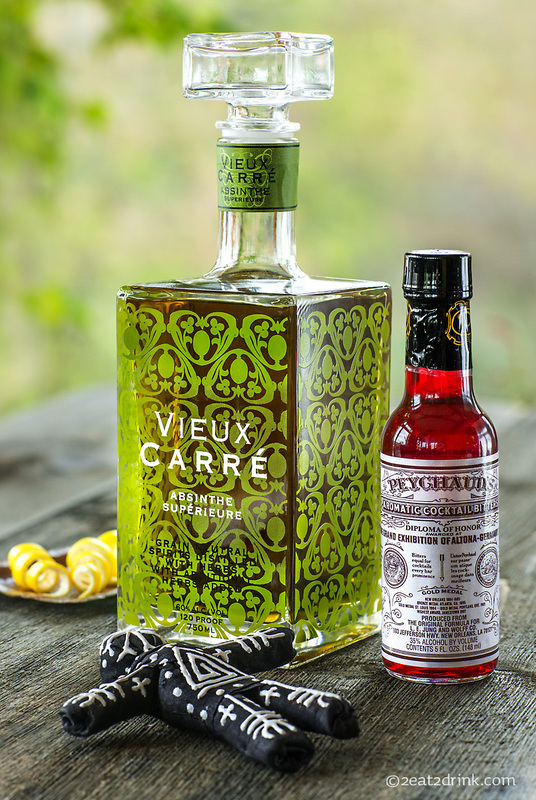 There are many variations on the Sazerac recipe, but I chose to base mine on Vieux Carré Absinthe Supérieure, an excellent absinthe from Philadelphia Distilling. Start by chilling an old fashioned glass by filling it with ice, then gather your ingredients. 2 oz. rye whiskey. I used Russel’s Reserve small batch. In a separate glass, over ice, mix the rye, simple syrup and bitters. Stir until chilled. Dump the ice from the old fashioned glass and give it an absinth rinse. Pour in enough to coat the entire inside of the glass, dumping if there is a lot of excess. Strain other ingredients into glass. Garnish with some lemon peel twisted over the glass. Sip to appease the spirits (and yourself). Á votre santé! 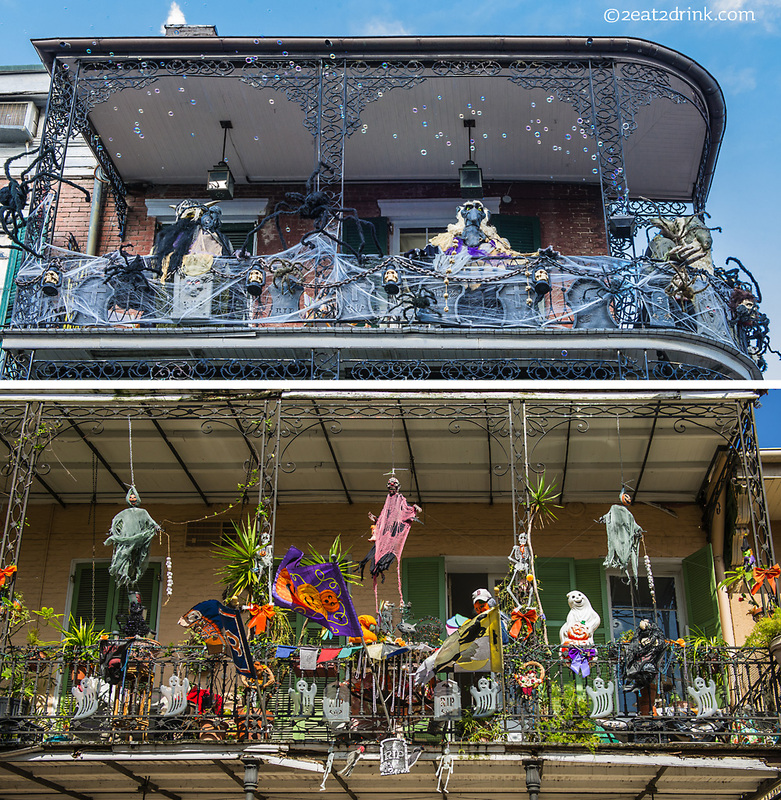 Typical French Quarter halloween decorations adorning 2 balconies. The top photo is complete with a bubble machine. The bottom photo is complete with an undead Boston Red Sox fan, which is very fitting for today. Congratulations to the World Champions! Drink like a local. Welcome to NOLA! Welcome to New Orleans! Heather and I just had an opportunity to take a quick honeymoon over Columbus Day weekend. So thank you, Mr. Columbus, for discovering our world and providing us with a long weekend! When we visit somewhere, I really do try to drink in the local culture. 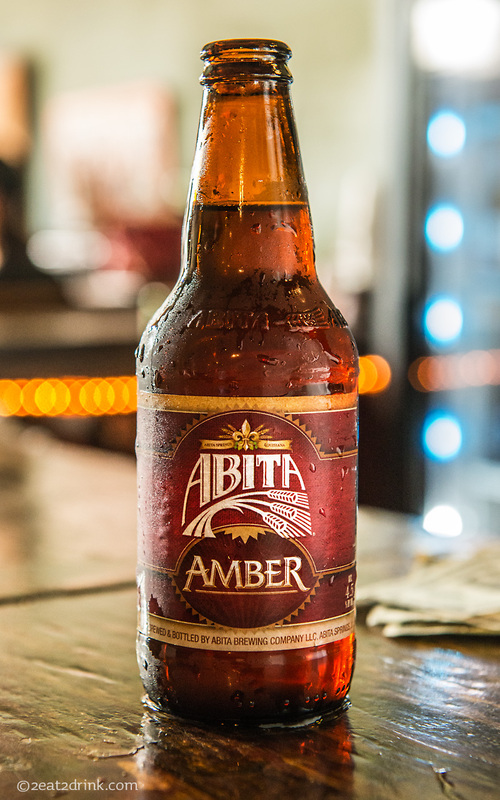 Our first day, it was an Abita Amber that fit the bill. It was smooth and malty with a touch of caramel. Excellent! 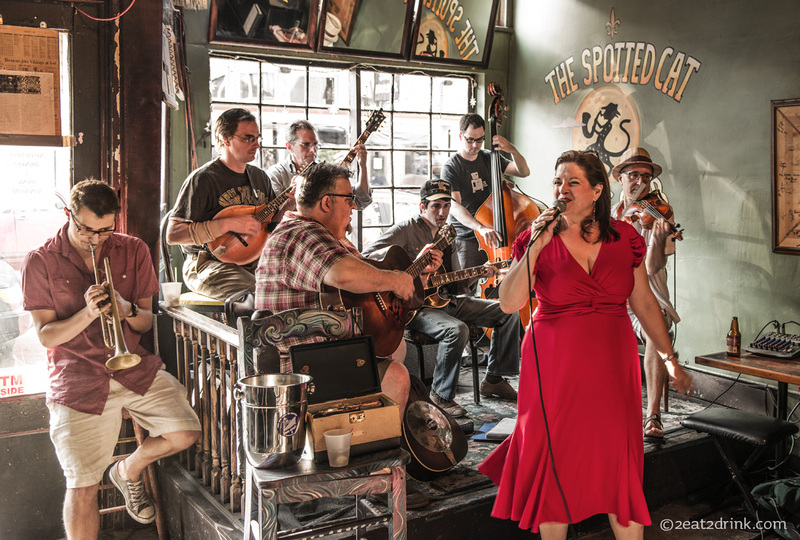 Perfect to sit back, relax and listen to some local jazz at The Spotted Cat on Frenchmen Street. I’m sure there are many great local brews, but this was one of my favorites. 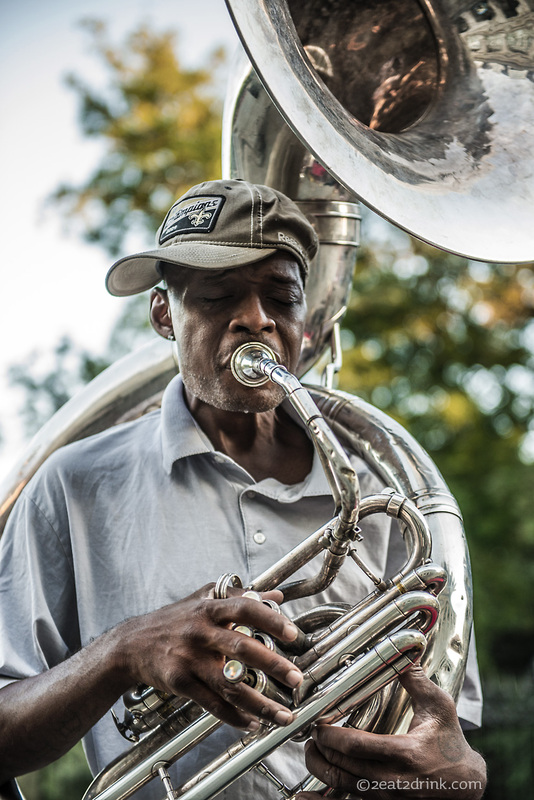 As we wandered into the colorful little club with tons of character, Rites of Swing was letting it all hang out. Yvette Voelker jumped in for an awesome vocal performance. I highly recommend that you track them down. More posts from NOLA coming soon. Cheers! The Aviation. Purple drinks are cool! Purple is a cool color….so I think a purple drink is cool too! We were introduced to this cocktail in New Orleans at the Green Goddess. 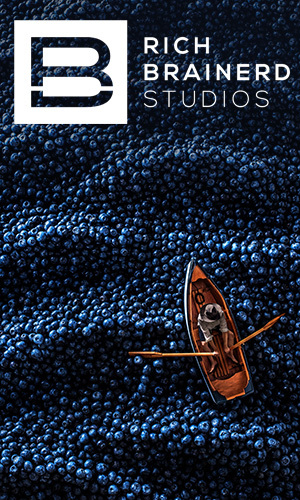 As we sat and watched one being made, we couldn’t help but ask about it. Which led us to try one and realize how good it is! It is perfectly refreshing on a warm evening! I did a fair amount of research to find the right recipe for this. There are many variations and theories on when it was invented. But most lead back to the start of the twentieth century and Hugo Ensslin’s 1916 Recipes for Mixed Drinks. Ensslin’s recipe called for 1½ oz. El Bart gin, ¾ oz. 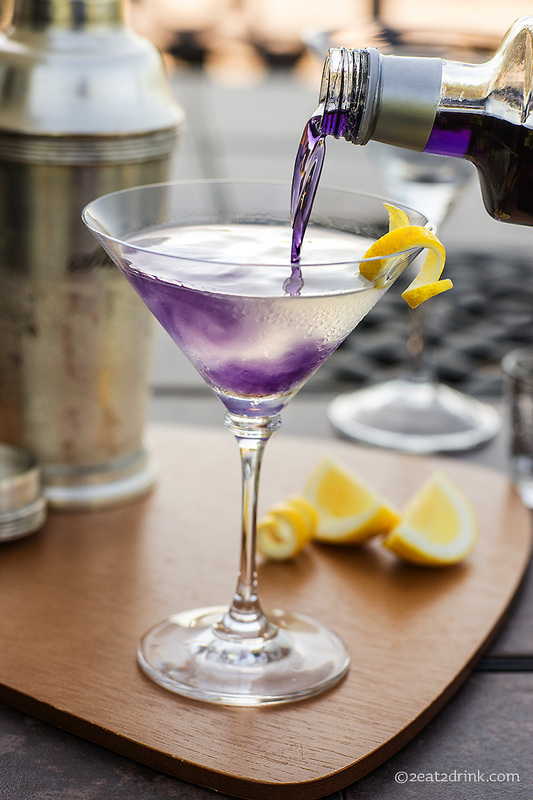 lemon juice, 2 dashes maraschino liqueur, and 2 dashes crème de violette. I settled on the NY Times recipe and added a touch of simple syrup to balance out the citrus. I like it both ways, but since I’m generally creating cocktails for Heather this is the official 2eat2drink recipe! FIll a cocktail shaker with ice, gin, lemon juice, Luxardo and simple syrup. Shake to chill, then strain into a martini glass. 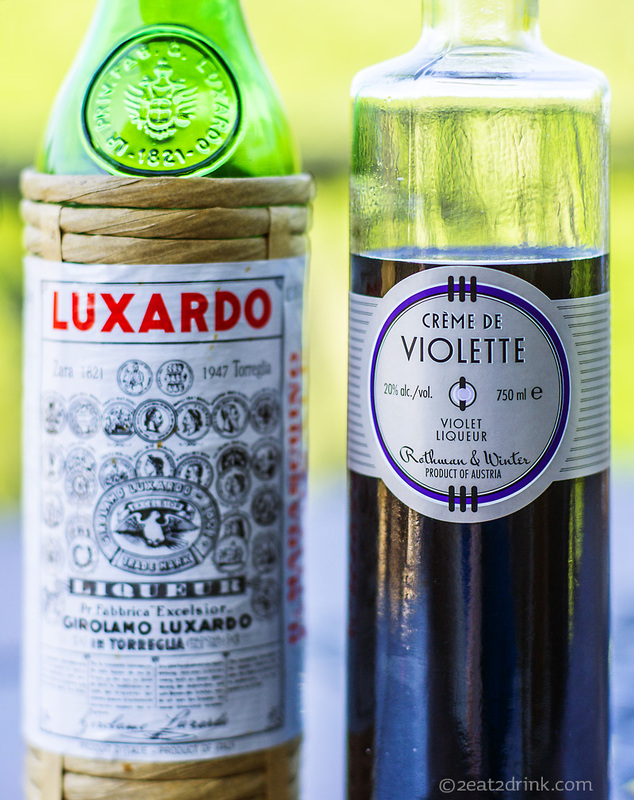 Slowly pour Crème de Violette into the glass to create a purple swirl that settles near the bottom. Garnish with a twist of lemon or a flamed lemon peel. There is quite a storied history behind this post. But before I begin, let’s get to the toast. Cheers to our friends Gina and Dave and their new baby boy! So…now for the story. It starts in August of 2010. Heather and I were on a short honeymoon getaway to New Orleans, eating dinner at the Green Goddess (home of the bacon sundae), when we heard Scotty the bartender and Chris the chef discussing grappa. For those of you not familiar with grappa, it’s basically a spirit distilled from the leftovers of the grapes after making wine. Prior to this trip, I may have referred to grappa as fire water. But I was intrigued by chef Chris’s description for Suprema grappa refosco, “That’s good frakking grappa!” (Note the Battlestar Galactica expletive, as I’d prefer to keep this family friendly 🙂 ) I ended up trying a taste and replying, “That is good!” Chef Chris just looked at me. “That’s good frakking grappa!” I amended. A cheer was given by all. So…circle back to Dave and Gina, and trying a couple different grappas at a local restaurant after telling the above story. Both of the grappas fire waters were very disappointing. I finally managed to track down a bottle of this good frakking grappa, and am looking forward to sharing it with Dave and Gina while toasting their new family addition in person. Cheers! 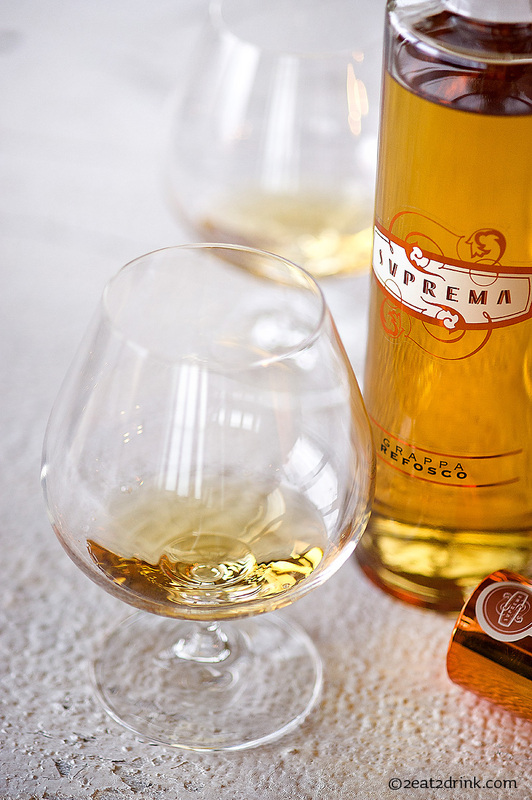 Suprema grappa refosco. Worth drinking from a snifter. Your initial taste is smooth and refined with a bit of dried fruit, met with a scent of vanilla coming off the top rim. There is a long pepper finish with hints of vanilla and honey. Good frakking grappa!